A simple chocolate cookie can be the perfect crave-worthy treat. Using ingredients you probably already have on hand, these Crackled Chocolate Drops are quick, easy, and best of all chocolaty. I still get excited about making recipes by my grandmother that contain chocolate. With the number of recipes in “The Art of Fine Baking,” the chocolate ones are surprisingly few and far between. Much of her baking from the early 1960’s was European inspired. Classics like Genoise, French-style Fruit Tarts, Strudel, and Danish Pastry allowed little room for chocolate. Also, chocolate with varying degrees of cocoa butter content were not nearly as accessible at the time as they are now. I like to think that as the popularity of chocolate and its availability grew, my grandmother would have eventually come up with a book full of chocolate recipes to die for. 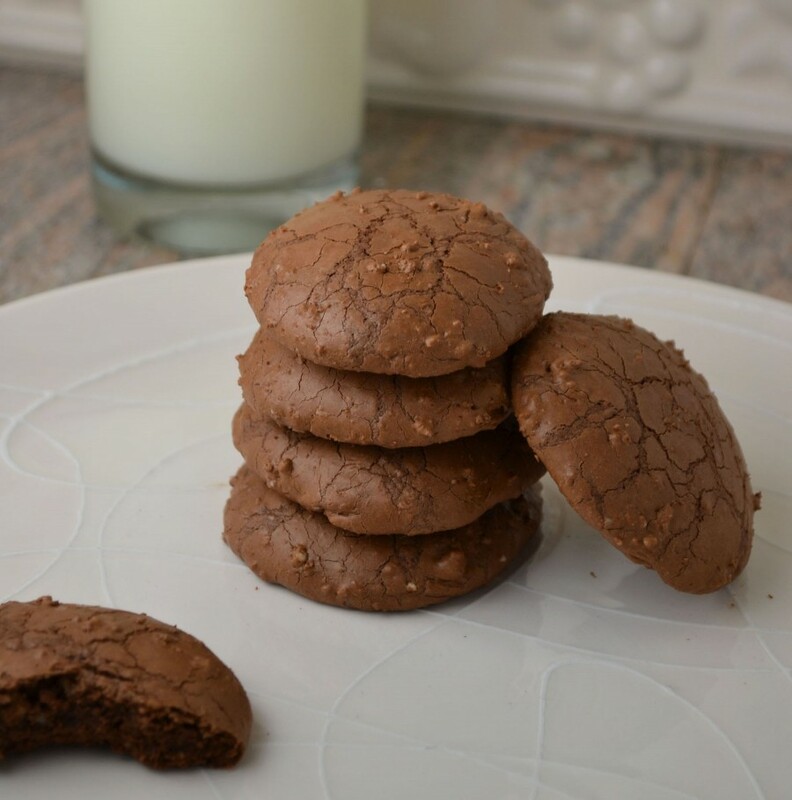 Her Brownie recipe has always been a favorite and in my opinion these crackled chocolate cookies aren’t far behind. The majority of this recipe is just chocolate and ground almonds. The original recipe called for grated almonds, which most of us don’t have time for. If you prefer a lighter, fluffier cookie and your purse strings are a bit looser, you can use Almond flour. The high egg yolk content then keeps the center of the cookie moist and chocolaty. As the smell of melted chocolate and almonds permeates your kitchen, these crackled drop cookies will barely make it out of the oven before they’re half gone. Preheat oven at 350 degrees. Grease and flour a baking sheet (or line with parchment paper). Melt chocolate over over a double boiler. While chocolate is melting, beat egg yolks and sugar together until light and fluffy. Add vanilla. Stir in melted chocolate, grated almonds, and flour mixed with salt. Drop or pipe small rounds of batter on prepared cookie sheet, leaving 1 inch between cookies. Bake about 25 minutes, or until cookies are crackled and dry. I made these tonight and they were fabulous despite some substitutions and less than ideal baking conditions. …. now what to do with the 8 egg whites hanging out in my fridge?